The Bohol large marine vertebrates (LAMAVE) project in partnerships with other non-government environmental organizations will hold the 2nd Bohol Dolphin festival on May 31, 2012 in Tagbilaran City to raise awareness on protecting marine mammals and the environment. The Dolphins protection festival caps the Ocean Month celebration and also aims to attract tourists through this unique, environmentally-conscious festiva, said Katrina Pahang of Bohol Rescue Unit for Marine Mammals (BRUMM), a non-government organization engaged in research on large marine vertebrates (LAMAVE) project in Bohol. Pahang further said the Bohol Rescue Unit for Marine Mammals (BRUMM) will provide access to information about whales and dolphins in one venue where students and adults can learn about the animals in one stop. The festival will include a parade, educational displays and activities, guest speakers and a dolphin mural. There will be booths from government agencies and NGOs to show their work. Different activities about dolphin biology and conservation will also be conducted both for children and adults, covering subjects like dolphin communication, diet, and threats to these animals. The event also comes at the heels of a controversy that has the international community criticizing a whale shark interaction in nearby Cebu. It may be recalled that while whale sharks also pass Bohol seas, efforts to organize interactions are starting and marine conservationists have agreed to put things in the right perspective to help Bohol attain a truly sustainable activity, Salutan added. Another NGO, the Physalus has slowly engaged local government units to set up enabling ordinances on dolphin interactions considering their being animals in the wild. 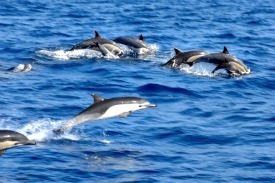 Responsible dolphin and whale watching tours are helpful to the animals. The tours inspire people to protect them and provide an economically viable alternative to hunting or capturing them for aquariums. “Proper decorum must be imposed when on an interaction with these mammals,” Dr. Alessandro Ponzo of Physalus commented. Former head of the Bohol Environmental Management Office and now an NGO director in Bohol Nunila Pinat explained that poorly conducted tours cause problems. Too many boats and getting too close to dolphins create stress for the animals and interfere with their socializing, breeding and feeding, Pinat added.